Pianoteq keeps improving in sound quality. Those still bemoaning its inauthenticity must be hearing a different instrument! Sounds better than ever. More piano models. Extra mic positioning options. Customise your purchase. The Pro version is expensive. A step forward; not a revolution. Needs a controller to get the most from it. While some software instruments seem to receive universal praise, it's fair to say that Modartt's Pianoteq has always divided opinion. Unlike many of its contemporaries, this is a premium piano solution that doesn't rely on samples to generate its sound but uses physical modelling instead. On the plus side, this means no massive storage requirements and fast preset loading times, but critics have claimed that this convenience comes at the expense of realism. 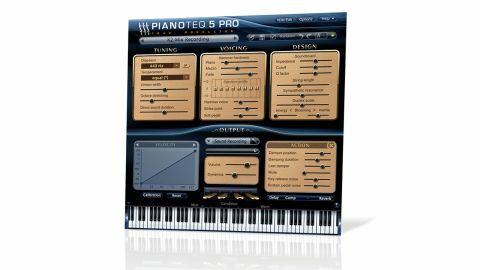 "There's definitely a greater sense of clarity, and the feeling that the pianos are 'breathing' and sustaining more naturally"
Although it's now at version 5, then, some would say that Pianoteq still has something to prove. Initially, nothing much seems to have changed - the interface is broadly similar to that of Pianoteq 4, but start playing and the under-the-hood developments become apparent. A key benefit of version 5, you see, is improved sound. Modartt has spent the last couple of years refining the note attack and soundboard models, and you can hear the difference. It's hard to put into words exactly how this revision sounds better, but there's definitely a greater sense of clarity, and the feeling that the pianos are 'breathing' and sustaining more naturally. It's worth noting that the improvements apply to all of Pianoteq's piano models, including the new Grand Piano K2. Said to combine elements from various source pianos, this has a great contemporary tone and is eminently playable. Another area of the software that's felt the hand of the developers is the microphone section. In fact, we now have an almost bewildering selection of options to choose from: 15 well-known mics are modelled, and you can choose from different polar patterns where applicable. What's more, as well as being able to position mics, you can now rotate them in three dimensions, attach them together and control the polarity and proximity effect. This is impressive technology, certainly, though you'll inevitably need some knowledge of how pianos are miked up in reality to get the most out of it. Still, it all adds to the sense of realism. That said, one of the beauties of Pianoteq is that it doesn't just do straight-up acoustic pianos: it can sound decidedly quirky if you want it to, and it also models electric piano and chromatic percussion. You can choose which of these 'flavours' you'd like when you buy any version (Stage, Standard or Pro - the latter reviewed here). The Acoustic Pianos flavour comes with D4 and K2 grands; Electric Pianos has R1 and W1 Rhodes/Wurly emulations and a CL1 Clavinet; and Chromatic Percussion comes with Vibes and Xylo packs. Any or all of the other instruments can be added later on, should you wish to buy them. If you're a long-time Pianoteq user, version 5 should put a smile on your face and serve to convince you that there's plenty of potential in the software still to be unlocked. Unacquainted pianists seeking an alternative to their bulky sample-based instrument should check it out, too. Those who've been dubious in the past might not find anything here to fully win them over, but they might just have to accept that, for many players and producers, Pianoteq is far from a compromise solution.